Once you have defined the output file and writing options, click Next to start the writing process. 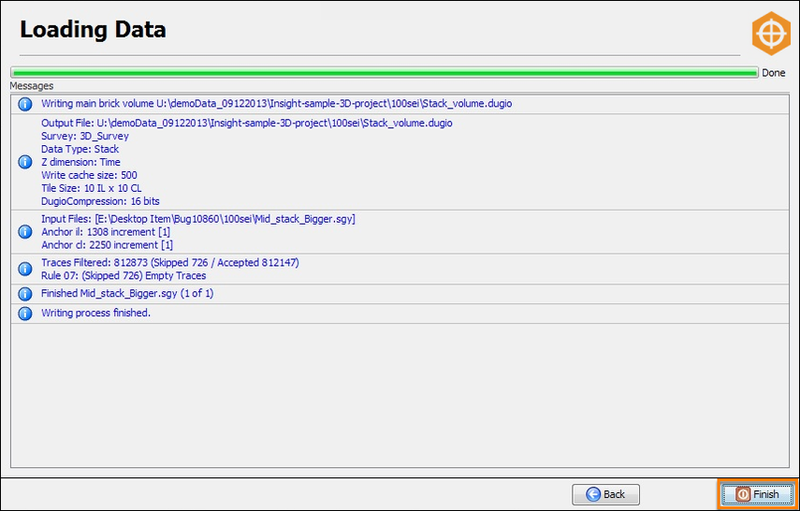 The import results will be displayed during the writing process. Once the writing process is completed, click Finish to exit the SEG-Y Loader. Note: If the operation is cancelled after optimisation has started, the primary volume is kept. Only the optimised volume currently in progress will be removed. DUG understands that importing SEG-Y data can be a confusing task. Whether you are using a trial version or a fully-paid licence, we will help you to import your data to Insight so that you will get the maximum out of your data. For more information, contact support at support@dugeo.com.